Every image in the gallery can have two descriptions: short and long. Usually the short image description is used for thumbnails and long description - for full-size images. To edit the image description simply select the image in the image list and enter the short description into the Short edit field and long description into the Long edit field. If several images are selected in the list then the descriptions of all selected images are modified at the same time. 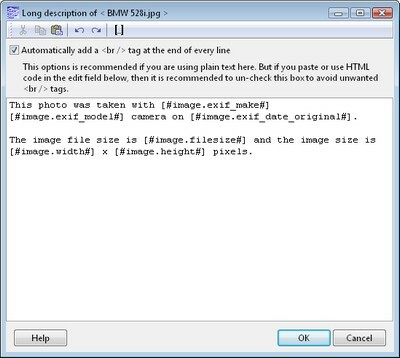 To add EXIF (or image file) information to the image description click the ... button next to the edit field. It will open the following multi-line text editor. To add any EXIF tag to the image description text click the button or press Ctrl + I on your keyboard and choose the tag you want. When Extreme Thumbnail Generator will generate the gallery page, it will replace the special tags you added to the description with the actual values. Please note, that image description text can have any HTML tags also.